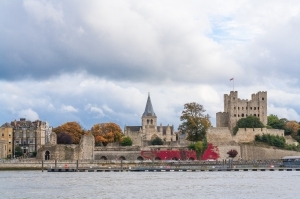 The 12th century Keep of Rochester Castle stands on the eastern bank of the River Medway. 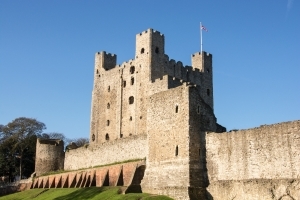 The castle stands within the walls of the Roman city of Rochester in Kent, which is in South Eastern England. The current Keep was built in 1127 and during the late medieval period it helped protect England’s coast from invasion. It was very important strategically, and it is one of the best preserved and finest examples of Norman architecture in England. Rochester Castle is situated on or close to the site where the Romans built their first fort to guard the bridge over the river carrying their legions from Dover to London. Centuries later, in 1088, Bishop Gundulf, one of William the Conqueror’s finest architects, began the construction of the actual castle. This lacked the Keep, but it had the bank, ditch, and stone curtain wall that survive to this day. The Norman tower-keep was built about 1127 by William of Corbeil, Archbishop of Canterbury, with the encouragement of Henry I. Subsequent archbishops of Canterbury retained control of the castle on the King’s behalf throughout the 12th century, until in the 13th century disputes between these and the King culminated in the siege of 1215. Garrisoned by rebel nobles, the castle was besieged by King John, who is said to have used the fat of 40 pigs to fire a mine under the keep, destroying its southern corner. The defenders were eventually starved out. King Henry III, King John’s son, eventually repaired the keep and added a complex of residential buildings. The royal court frequently visited the castle during the 13th century. 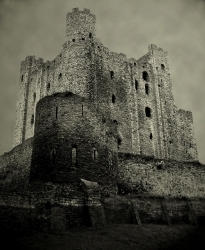 There was a second siege at Rochester Castle in 1264, when some nobles, headed by Earl Simon de Montford, rebelled against the King. The rebels captured the bailey but were unable to take the tower and were eventually driven off by the royal soldiers and forced to surrender. This second siege was more destructive than the first, and the damage incurred left a big impact on the castle. The royal hall and bailey chambers were never rebuilt, and from here onwards the castle went into a period of decline. In the 14th century King Edward III as well as King Richard II ordered some repairs, and from the 15th century onwards, the bailey was let to private tenants. In 1870, Rochester Corporation purchased the castle and opened the grounds to the public as a park. Repairs were done in the early 20th century and in 1965, the Ministry of Works assumed responsibility of the keep, later passing this on to the English Heritage in 1984. Rochester’s great square keep is one of the tallest in the country, being 113 feet high, 70 feet square and having walls 12 feet thick in places. Consisting of three floors above a basement, it has attached a tail protruding fore-building, having its own structural set of military defences. The bailey surrounds the keep, which is at present occupied by the gardens. The entrance to the north-east lies near the site of the medieval main gatehouse, and the keep lies in the south-east corner. The keep is one of the most impressive surviving medieval castles. The main exterior consist of irregular Kentish ragstone. The south-east turret of the keep is circular in plan, unlike the original square turrets on the other corners. This is because it was rebuilt in the 1220s, after the original square tower collapsed in the siege of 1215. The interior of the keep has stood as a vast roofless space since the 17th century. Deep sockets indicate the levels of the missing timber floors, and the external walls contain the remains of windows, latrines and fireplaces. All this is accessible through a non-considerable number of stairs winding around the walls of the castle. Due to this, visits are definitely not possible for those with wheelchairs or walking difficulties. It is important for small children to be kept within sight at all times. The castle is quite high and there are many levels, therefore in the middle-section, it is not so well-lighted. There are a series of deliciously creepy spiral staircases, stone-flagged corridors and parapets at the top. The wall-walk at the level of the battlements provides awesome views over the city of Rochester. If one looks towards the south-east, one can see Boley Hill. Quite worth the stairs.